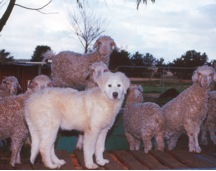 I breed maremmas or to use their full Italian name Cane da pastore Marammano-Abruzzese. I breed angora goats and knew a lot of people who used them. 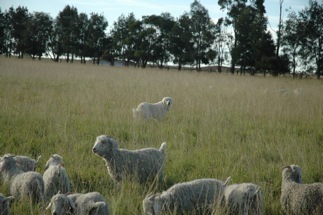 I breed Angora goats and most of the dogs are paddock workers though I interact with them frequently. I am more than happy to talk about these dogs and always available for ongoing support. I may not have all the answers but will give my opinion and help where I can! 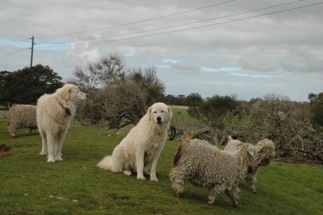 With a relatively small property (approx 20 acres) and more than one maremma it is important that the dogs be versatile. Because the stock locations are constantly changing with the weather/season, husbandry needs and feed availability a dog needs to be able to be moved to a different situation/group of livestock with minimal fuss if required. I usually have the dogs in pairs when out in the paddock but younger dogs need experience flying solo as well! Also since we live on a busy highway I usually have a dog or two in the house yard. Exactly who varies. An example of this was when I recently needed to confine the current ‘houseyard’ dog as she’d just had surgery but this would leave the chooks unprotected and foxes are good at seeing a window of opportunity. So I moved one of the paddock dogs into the house yard which also gives the young female he was with a turn at being on her own with her stock. Thanks to John for a great look at his maremma family!